In Honor Of Design: *CLOSED* Giveaway: $50 Gift Card and Acessories to Deloom Boutique! 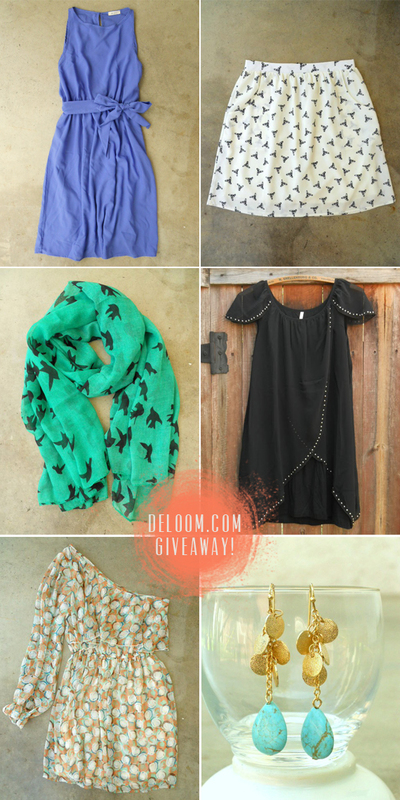 *CLOSED* Giveaway: $50 Gift Card and Acessories to Deloom Boutique! You all are going to love all the goodies over at Deloom! In honor of Mother's Day, Deloom is offering a giveaway today with prizes for TWO winners! The first prize winner will receive a $50 shopping spree to spend at Deloom.com! The second prize winner will receive a beautiful scarf and earring set! Giveaway is open to International Readers. Have fun and best of luck! We are trying out Rafflecopter which is a new and very easy way to enter giveaways. (Should be much easier for those of you without blogger profiles. You just need an email address to enter!) You can earn multiple entries as specified below. Also, if you already follow IHOD you can still earn those entries! Fun giveaway!! Wow, I can't believe all the cute affordable dresses! Make sure to enter my striped tee giveaway this week! Thank you for the introduction to this lovely boutique! Love the Tiered Peony Chiffon Party Dress! Ahh just entered! SO excited about this giveaway Anna! i'm in love with those earrings!! I immediately signed up for this one!! I did them all, hope I win! Great give away.... going to be checking into that site regularly now! Thanks!! I love new stores! Great find!! I love the Yellow Songbird Wrap Dress. Gorgeous! What a cute shop, thanks for the heads up! I love the dresses and especially the blue one you featured! All the stuff is so cute!! I would definitely stock up on some scarves and dresses! The stuff is so cute!!!! great giveaway! i'm loving their dresses! I love the mint rosette blouse! Perfect with a summer sweater. The Yellow Songbird Wrap Dress is my favorite too!